Salvador Salvador, bass clarinet; Juan Carlos Baguena, oboe; Jose Ramon Encinar, Orquesta de la Comunidad de Madrid. Stradivarius STR 33845. At least you can't say new, contemporary music isn't adventurous. You really never know quite what to expect, from cacophonous din to spiritual exaltation to romantic sentimentality. 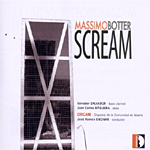 Take Italian composer Massimo Botter (b. 1965) for instance. His latest album, carrying the questionable title Scream, contains not the background score for another Wes Craven horror picture but four short and fascinating instrumental and orchestral compositions that run high to pictorial percussion. The selections on the disc cover a period of about twelve years, from one of the composer's earliest works to one of his latest. The thing is, although there is a greater complexity in the later pieces, there is also a distinct similarity in tone among them; they are dark and aggressive. You'll find little serenity here, a little of which might have lightened the mood considerably. 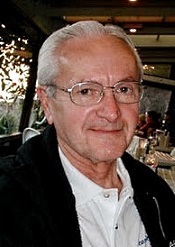 The first track is "Sentiero in un deserto di lava" ("Path in a desert of lava," 2006), a sixteen-minute piece for bass clarinet and orchestra that depicts a journey to the slopes of Mt. Etna. Naturally, it includes any number of volcanic eruptions en route. The music is highly episodic and descriptive, with the sonorous timbres of the bass clarinet evoking the hazards and beauties along the traveler's path. OK, so you won't hear the kind of universally memorable tunes in Botter's music that you'll find in a Beethoven or Mozart concerto, nor the emotional intensity of a Bartok or Stravinsky. Still, the booklet note compares "Sentiero" to something "vaguely Berg-oriented," and, indeed, if you like the romantic-expressionist creations of Austrian composer Alban Berg, you may well enjoy this music, too. Next is "Seven Blades" (2008), nine minutes long, which Botter wrote for an ensemble of only seven instruments, so it works as a small chamber piece. It portrays "a metropolitan journey" and as a consequence is a tad less rambunctious than the Etna outing. Following this is "And at the end... the scream" (2007), eleven minutes long, for oboe and fourteen instruments, the title of which gives the album its name. The writing is leaner here than in the first two pieces, while being edgier and more mysterious as well. Again it's the soloist who stands out, yet the percussion also has its day, the whole work casting a slightly sinister shadow. I liked it best of all the works on the disc and would love to see Botter expand it into something longer and more substantial, perhaps using it as one movement in a larger symphonic work. The final composition is "Zeula" (1996), fourteen minutes. I understand it won the Memoriam Takemitsu Award in Tokyo the year of its première and it derives from a reading of sci-fi/fantasy author Ray Bradbury's The Illustrated Man. Having spent many an hour teaching Bradbury's collection of short stories, I had high hopes of Botter's music eliciting fond memories and, more important, conjuring up vivid images of Bradbury's tales. Alas, it didn't happen. When I finished listening, I hadn't the faintest idea what notes related to what narratives. Nevertheless, I did find the music appealing, a bit more traditional in comparison to the other works on the disc, with lusher orchestral harmonies. Probably few other conductors or orchestras could play this material any better than Maestro Jose Ramon Encinar and the Orquesta de la Comunidad de Madrid. Encinar and his forces are as highly expressive as this emotionally charged music demands, without their ever resorting to the temptation of inordinate hostility, which I could well see happening. Instead, they create simple, straightforward soundscapes of graphic beauty and, at times, sublime if contentious eloquence. The sound, recorded in Madrid in 2009 and 2010 (the first track recorded live) stretches a fair distance across the room from speaker to speaker, whether it be the full orchestra or the seven instruments of "Seven Blades." While there isn't as much depth as there is width, it's hardly noticeable. Clarity is outstanding, with the many percussion parts especially prominent and well defined. Highs also ring out clearly, with a fine treble extension to match the disc's laudable midrange transparency and dynamic impact. Also, Borodin: Symphony No. 2. Kiril Kondrashin, Concertgebouw Orchestra. Philips 475 7570. 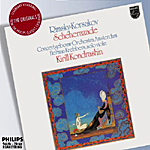 Recorded in 1979, Kondrashin's performance of Scheherazade is one of my favorites in this work, the others coming from Reiner (RCA or JVC), Haitink (Philips), and Beecham (EMI), with Kletzki (on a hard-to-find EMI Eminence) and Mackerras (Telarc) not far behind. This Philips Kondrashin disc also marks the fourth incarnation of the recording I've owned: one LP and three CD's. I'm not sure I didn't like it best on LP, but this 96kHz/24-bit Philips "Originals" release is undoubtedly the best-sounding of the Kondrashin CD's. Kondrashin's way with the work is big, robust, and energetic, yet even-tempered, too, the conductor filling out all the varied contrasts in the work from soft to loud, serene to bombastic, in equal measure. It is probably the best all-around interpretation one can find, even if it doesn't score high in any single area. For instance, I think Haitink beats him in poetic beauty; Beecham beats him in sparkle and charm; and Reiner beats him in excitement and sonics (especially in the audiophile-quality JVC XRCD edition). But there is no discounting Kondrashin's reasoned, rational, levelheaded approach to the music. This, incidentally, is in contrast to Valery Gergiev's more-recent Kiev recording (also on Philips), which I found too erratic. Kondrashin makes the four movements of the piece more of a whole, the entire work hanging together better as a single composition rather than appearing like a series of unrelated tone poems. I wish I could say the same thing of the coupling, though, the Borodin Second Symphony, which Kondrashin recorded a year later in 1980 with the Concertgebouw. It seems as though it's more in the Gergiev Scheherazade style, rather too boisterous and mercurial for my taste. But, then, I'm used to the refined, yet stimulating Borodin Second Symphony recording made years ago by Jean Martinon for Decca. On the Rimsky-Korsakov tracks, the sound of this 2006 reissue at first didn't seem any different to me than my oldest of Kondrashin CD recording; then, after numerous comparisons, instantly switching back and forth between two CD players, I began to detect a couple of minor things: The 24-bit edition (originally remastered in 2001 and here appearing for the second time) is subtly smoother and maybe, just maybe, a touch more dynamic. Nevertheless, the differences are so small that I couldn't really recommend the disc to people who already own either of the earlier versions. This newest edition is still lush, plush, and as radiant than ever, and it will not disappoint many listeners. The Borodin, recorded live, is brighter and noisier than the Rimsky-Korsakov, with more of a small background hiss noticeable at times. I'd buy it for the Scheherazade music foremost. Also, Concertino for Oboe & Strings; Fantasy for Oboe Solo. Nicholas Daniel, oboe; Vernon Handley, Royal Liverpool Philharmonic Orchestra. Conifer 75605 51258 2 and 75605 51273 2 (two separate albums). Who says they don't write 'em the way they used to? British composer Sir Malcolm Arnold (1921-2006) may have been the twentieth century's last true musical Romanticist. Certainly his prodigious work for film, stage, and concert hall helped him keep attune to popular taste. Although I believe it is still his Fifth Symphony for which people may best remember him (film scores like Bridge on the River Kwai aside), some of the others of his nine symphonies are worth consideration as well. This is especially true as time passes, and we notice how little of lasting importance anyone else has contributed over the past fifty years. 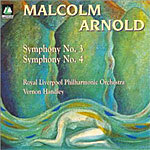 Vernon Handley's Conifer recordings of Arnold's symphonies should go far in bringing the composer's music to an even wider audience. Here, we consider two separate albums: The first of the recordings includes the Third Symphony (1957) and is, frankly, the least important of the three symphonies under review, yet in its own way it is the most accessible. It does nothing extraordinary, save perhaps in its use of an unusual three-movement format. It is mostly pastoral, lightweight, and upbeat. It makes for pleasant, relaxed, largely unchallenging listening. The Fourth Symphony (1960), on the other hand, is full of contrasts. It begins with an Allegro using a good deal of Central and South American percussion to play what is essentially a calypso-type jazz tune. Was Arnold's film music background showing? The fast movement that follows also uses a Caribbean percussion section, although to more symphonic effect. The slow Andantino returns us to a feeling of calm, but then the finale pitches us headlong into something I can only describe as sheer anger! Toward the end, a march bursts forth, winding down only in the last minutes. It's quite a ride, and Arnold may have written it to say something about his attitudes toward race relations. The two symphonies together on one disc provide a good overview of the composer's many talents and tempers. On the second album we have the Ninth Symphony (1992), which Sir Malcolm said was to be his last composition. Whether it was age or superstition that led him to such a pronouncement is unclear. Beethoven, Schubert, Bruckner, and Mahler all ended their symphonic creations on number nine. Be that as it may, Arnold's Ninth seems an appropriate conclusion to his symphonic output. It is essentially tragic in its outlook, with only a closing moment in the long, slow, Mahler-like finale to bring us around to anything like sweetness or light. Accompanied by several charming oboe works, this disc, too, provides a good, all-around glimpse of the composer's many moods. Conifer's sound in both discs is understandably alike, their having been recorded only a couple of months apart in the spring and summer of 1996, although in different venues. The sonics are clear and natural, warm and winning, without being as transparent or dynamic as they could be. Imaging, particularly front to back, is good; deep bass is present but not prominent; highs are airy but not pronounced. 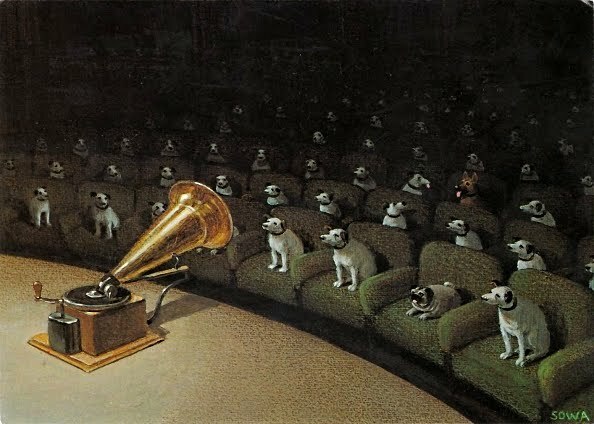 It is audio that serves the music; it will go unnoticed by most listeners, unlike some audiophile sound that can unintentionally draw notice to itself. Arnold devotees will want both discs, if they don't already have them. New listeners, though, might want to start with Nos. Three and Four. Also, Goss: The Albeniz Concerto; Albeniz: Espana; Rodrigo: Invocacion y danza. Xuefei Yang, guitar. Eiji Oue, Orquestra Simfonica de Barcelona I Nacional de Catalunya. EMI 50999 6 98361 2 1. If the thought of a relatively young Chinese woman playing the solo guitar part in Rodrigo's most-famous concerto gives you pause, it shouldn't. Xuefei Yang (b. 1977) is a superb guitarist and presents a worthy, if slightly different, take on the music. What's more, she offers three other pieces on the disc that deserve attention. Let's take them one at a time. 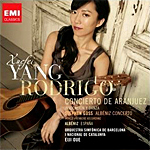 First, there's the celebrated Concierto de Aranjuez, which Joaquin Rodrigo (1901-1999) wrote in 1939 and which pretty much established Rodrigo's reputation as a leading composer for the classical guitar. Despite the fact that Rodrigo always claimed the gardens of Palacio Real de Aranjuez inspired the writing, because he wrote it at the end of the Spanish Civil War, one can't help thinking that at least a part of it is tinged by the melancholy of those war years. Rodrigo's wife denied this, saying the slow movement drew on both their happy days together and a miscarriage she endured. Whatever, it's a beautiful, evocative piece of music, and Ms. Yang pulls it off nicely. The opening movement is lively enough, yet Ms. Yang also brings to it a sense of great dignity and refinement. It's more than just pretty music; it's quite emotionally shaded. Still, it's Ms. Yang's handling of the middle-movement Adagio that may raise eyebrows. I don't think I've ever heard it played with such heartfelt sentiment and delicacy. The guitarist seems to put her soul into each note she plays, and the listener cannot help coming away with a newfound respect for the concerto and for Ms. Yang. 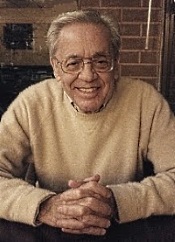 Rodrigo described the concerto itself as capturing "the fragrance of magnolias, the singing of birds, and the gushing of fountains" in the gardens of Aranjuez, and certainly the final movement, marked Allegro gentile (suggesting music played quickly, cheerfully, yet gracefully and genteelly), conveys just such a spirit most of all. Ms. Yang gives her thanks in the booklet note for having a real Spanish orchestra (Orquestra Simfonica de Barcelona I Nacional de Catalunya) supporting her in the music, the same orchestra that premiered the work so many years ago. It certainly doesn't hurt. Among the other pieces on the program is The Albeniz Concerto by Stephen Goss (b. 1964). Goss wrote his concerto in 2009 as a tribute to Isaac Albeniz (1860-1909), the great Spanish pianist and composer, Goss using many of the man's piano themes for the piece, which Ms. Yang and the Barcelona Orchestra commissioned. While the work may not achieve the stature of Rodrigo's concerto or the virtues of Albeniz's piano music alone, it does have a pleasant style and goes down easily. The final two pieces on the album are for solo guitar: Albeniz's Espana, Op. 165, with its prominent "Tango" the salient feature, here presented in a transcription for guitar and played as sensitively as I've ever heard it done on any instrument; and Rodrigo's Invocacion y danza (1961), probably the composer's most-popular solo guitar work, "a homage to Rodrigo's friend and mentor Manuel de Falla." It's a slightly gloomy but fascinating affair, and one Ms. Yang seems to know quite well. Although it's hard not to enjoy Ms. Yang's music making, not everyone may appreciate the sound of the disc. EMI recorded it in 2010 at L'Auditori, Pau Casals Hall, Barcelona, placing a good deal of emphasis on the guitar. By that, I mean that while the orchestra is nicely reproduced, clean and clear, the guitar seems disproportionately large, looming out in front of the ensemble in a rather fat, bulbous manner. The fact is, the guitar doesn't sound well integrated with the orchestra but rather as though it were miked somewhere else and added later. I'm sure that wasn't the case, but with the guitar as big and soft as it appears, that's the impression it leaves. Otherwise, hardly a complaint. CHICAGO, Dec. 22, 2010 — James Ginsburg, founder and president of Cedille Records, Chicago's acclaimed independent, nonprofit classical label, was recently honored with an arts achievement award bestowed by a local foundation. The Helen Coburn Meier and Tim Meier Charitable Foundation selected Ginsburg as one of four 2010 Meier Achievement Award honorees, each of whom received $25,000, plus funds to cover income tax liability. At Ginsburg's request, the total award check for $33,333 was made payable to The Chicago Classical Recording Foundation, Cedille Records' parent organization. The Grammy Award-winning Cedille label, which Ginsburg launched in 1989, champions exceptional classical artists and composers in and from Chicago — a trove of talent long overlooked by the international recording conglomerates. In a letter to Ginsburg, Helen Coburn Meier, president and co-founder of the Wilmette, Ill., foundation, said, "Something had to be done, and you did it. Among the many thank-yous from living musicians, please add our appreciation for the special part you play in our cultural life." The Meir Foundation "recognizes Chicago-based artists in mid-career who push the artistic envelope," according to a foundation statement. The organization relies on nominators, with the final selections made by its board. "There are no applications, no project to submit, and no outcome measurements." Other 2010 award recipients are sculptor Terrence Karpowicz, multimedia artist Miroslaw Rogala, and dancer and choreographer Molly Shanahan. The Meier Foundation is online at www.meierfoundation.org. Cedille Records is at www.cedillerecords.org. Piano Concertos Nos. 1 and 2; Rondo Brillant, Op. 29. 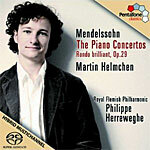 Martin Helmchen, piano; Philippe Herreweghe, Royal Flemish Philharmonic. PentaTone PTC 5186 366. I don't know about you, but the piano concertos are not the first pieces of music I think of when somebody mentions Felix Mendelssohn (1809-1847). I wonder if it isn't perhaps because the composer himself never felt entirely secure about his piano-and-orchestra compositions. Which is odd, of course, considering that Mendelssohn was a fine pianist and that his Songs Without Words for solo piano were tremendous hits with critics and the public. Anyway, the present disc joins a relatively small group of recordings devoted to the composer's piano-and-orchestra works, and a welcome addition it is. Things begin with the Piano Concerto No. 1 in G minor, Op. 25, written in 1831. Mendelssohn marked the opening movement Molto allegro con fuoco, and certainly pianist Martin Helmchen and conductor Philippe Herreweghe take him at his word with a furiously festive and invigorating pace. Following the opening swirls, we find a relaxing calm in the Andante, where Helmchen creates such a mood of tranquil bliss, it seems to me hard for any listener to resist it. We expect Mendelssohn to be magical, enchanting, and it is in this slow movement that he fulfills the promise. The final section, a Presto, continues without a break, ending the concerto with the kind of brilliant fireworks from the composer and dazzling finger work from the pianist that began the piece. Piano Concerto No. 2 in D minor, Op. 40 (1837), shows an added maturity on Mendelssohn's part, as it is not so frolicsome, rambunctious, or playful as No. 1, even though the opening Allegro is still most passionate. This concerto is simply larger, longer, and more serious in tone than its predecessor. Like the earlier concerto, the movements run together without pause, the Adagio taking up where the mood of the preceding movement leaves off. It isn't as bewitching as the first concerto's slow section, but it is surely attractive and played most lovingly by Helmchen and Herreweghe. Again the concerto ends with a Presto, this one a tad more restrained. Apparently Mendelssohn by this time was no longer trying to wow an audience, and neither do the players. The album ends with the Rondo Brillant for Piano and Orchestra in E flat, Op. 29 (1834). It exudes a positive confidence despite the composer's reservations about his abilities. While it may not display the invention of Mendelssohn's best work, it is a pleasant, self-assured piece of music nonetheless. The sound, which PentaTone recorded in Antwerp, Belgium, in 2010, is big without being overpowering. Although the piano seems a touch too wide, the engineers have nicely integrated it with the orchestra, making a reasonably realistic presentation. There is a degree of softness to the orchestral accompaniment, however, and some bass overhang tends to obscure midrange detail a bit. This a multichannel SACD hybrid affair, so perhaps played back in more than two channels would help clarify the sound somewhat better. Also, In Memorium; Festal Dance. Adrian Leaper, RTE National Symphony Orchestra. Naxos 8.572020. 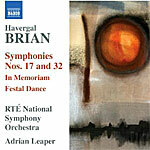 British composer Havergal Brian (1876-1972) was something of a throwback. While he wrote most of his music during the twentieth century, he could just as easily have lived most of his life in the nineteenth. If you haven't heard any of his prodigious output, including thirty-two symphonies, it's probably because the twentieth century pretty much ignored him. Nonetheless, he persisted, writing his last eight or so symphonies when he was in his nineties. Over the past twenty-odd years, the Marco Polo and Naxos labels have tried to provide the listening public with as much of his work as possible, so today you'll actually find a good deal of it in the catalogue. Still, you'll have to look for it. The present album begins with two early tone poems, the first called In Memorium (1910), subtitled "Vigueur dessus" (possibly meaning "utmost strength") and written in three movements. However, the composer left no clues as to what it was about, what the subtitle actually meant, or who the music might have been memorializing. It sounds like a funeral dirge, arranged as a kind of solemn march, but, then, much of Brian's music sounds solemn, so it's hard to tell. The second tone poem, composed two years earlier, is Festal Dance (1908). Its tone is the opposite of In Memorium, with a sort of Richard Strauss satiric appeal to it. It's more fun than the first number, both of them showing an admirable economy of style yet providing a good deal of ornate flourish, too, with Festal Dance perhaps beginning life as part of an unfinished symphony. Be that as it may, it's enough to give any orchestra and any stereo system a workout. After these tone pictures we get two of Brian's later works, the Symphonies Nos. 17 and 32. They are very short, and Brian wrote them when he was in his late eighties and early nineties respectively. Symphony No. 17 (1960-61) is in a single, three-part movement lasting about thirteen minutes. It varies from huge orchestral crescendos to soft, light, reflective moods, with some of the same slow march rhythms heard in his music of fifty years before. Symphony No. 32 (1968) was the last composition of any kind Brain wrote, so we can see where he ended up. Like most of his work, it's dark and edgy, more than a little noisy, eventually high spirited and jubilant, and maybe a tad introspective. Who knows what goes on in a person's mind. Adrian Leaper and the RTE National Symphony Orchestra, Ireland's Public Service orchestra and one of its most-popular ensembles, play the music as though it were Bruckner or Brahms, music with which Brian shares some superficial resemblance. They place great emphasis on the more lyrical aspects of the works, where they can find it, as well as the purely bombastic, which is easier to come by. Brian was, after all, an unusual fellow, composing a ton of music over an enormously long lifetime, while hardly causing a ripple in the world's musical stream. Originally recorded in 1992 and previously released on the Marco Polo label, the sound is fairly big, as expected, yet reasonably clean and dynamic. The midrange shows good depth and moderate transparency despite being a trifle thick and displaying a degree of reverberation. The latter provides a realistic concert-hall ambiance, though, so it's hard to complain. The Eric Whitacre Singers; Laudibus; The King's Singers; Pavao Quartet; Hila Plitmann, spoken Hebrew; Christopher Glynn, piano. Decca B001 4850-02. American composer, conductor, and lecturer Eric Whitacre (b. 1970) has enjoyed a relatively sudden spurt of popularity in the past half dozen years or so, thanks in large part to several best-selling record albums of his mostly choral music, as well as to his "Virtual Choir" projects on YouTube. In 2010 he signed a long-term record contract with Decca, the present disc apparently his first release for the company. You may have heard his Hyperion recording Cloudburst several years ago; it earned him a Grammy nomination. 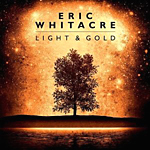 Light & Gold is much in the same vein, the music sung and played by various groups, including his own Eric Whitacre Singers, the choir Laudibus, the King's Singers, and the instrumental Pavao Quartet, with assorted soloists thrown in. Light & Gold roughly follows a path from morning till evening, with texts running high to Latin, which Whitacre, a student of the Juilliard School, seems to favor. The program begins with one of Whitacre's most-popular pieces, the title work "Lux Aurumque" ("Light and Gold"), written in 2000 and sung by Whitacre's choir. The work is sweet, pure, amiable, and elegant, an appropriate representative of the remaining music on the disc. It is quite accessible, quite lilting and lovely, the singers' voices floating over the listener in angelic tones. The composer based "Lux Aurumque" on a poem by Edward Esch, translated into Latin: "Lux, Calida gravisque pura velut aurum Et canunt angeli molliter modo natum: Light, warm and heavy as pure gold and angels sing softly to the new-born babe." The other pieces on the program follow suit. There are sixteen brief choral works altogether, the next being "Five Hebrew Love Songs" from 1996, which Whitacre describes as "troubadour songs for piano, violin and soprano," here adapted for choir and quartet. Each song is a little "postcard" capturing a specific moment that he and his girlfriend at the time (and now his wife) Hila Plitmann shared, she writing the lyrics and he doing the music. "The Seal Lullaby" is especially fetching, written in 2004 for a movie that never happened. Like the other melodies, it is appealingly simple and direct. "Leonardo Dreams of His Flying Machine," composed in 2001 to a poem by Whitacre's friend Charles Anthony Silvestri, appears more animated than the others, with a stronger female choir. And so it goes unto the last track on the disc, "Sleep," which Whitacre originally intended as music for the Robert Frost poem "Stopping by Woods on a Snowy Evening." Unfortunately for the composer, Frost's estate had shut down any use of the poem, so Whitacre asked his friend, the aforementioned Silvestri, to write new words to the music, which we have here. Now, there is a "however." While I doubt that any listener would not respond to the gentle honesty and often ravishing beauty of Whitacre's music, I couldn't help thinking as I listened that a lot of it seems alike: the soft, tranquil tone; the calm, soothing tempos; the straightforward, sometimes sentimental style; the uniformly reassuring voices. It all tends to make the individual pieces merge into one indistinguishable mass. A lovely mass, to be sure, but a lightweight, cushy, more-than-comfortable mass as well. One can hardly fault Decca's sound, recorded at St. Silas Church, London, in August, 2010. Voices are clean and smooth; the stereo spread is extensive; and midrange transparency is ideal, without being in any way bright or abrasive. In other words, the disc's audio qualities complement the pleasurable nature of the music. Arranged for violin and piano by Friedrich Hermann. Alex Strauss, violin; Cord Garben, piano. Naxos 8.570213. 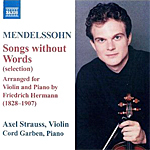 Even if you don't think you've ever heard any of Felix Mendelssohn's piano works he called Songs Without Words, the pieces in which he wrote down some musical ideas that he said could not be verbalized, you will undoubtedly still recognize a few of them from this selection. The first one, especially, the Allegretto grazioso, Op. 62, No. 6, better known as "Spring Song," will put a smile on your face, because you'll know it from a multitude of Warner Bros. and Disney cartoons. What we have here is not just another collection of the usual piano compositions but the arrangements Friedrich Hermann (1828-1907) made of them for violin and piano. Not that the piano doesn't work well alone, but the duets provide an extra measure of haunting pleasure in the pieces. Alex Strauss, violin, and Cord Garben, piano, play with sparkle and sensitivity, and they have varied the selections well enough to keep one interested from beginning to end; a most enjoyable experience. Moreover, in this 2007 release the Naxos engineers captured the two performers admirably in an acoustic that is just close enough to be vivid, yet distant enough to impart a welcome bloom. Although the twenty-two selections on the disc have a total playing time of well over an hour, they are all so brief and so intimate, the time seems much shorter. (Not that that is a good thing; one comes away wishing there were more.) All told, it's a sweet set. Adapted from a review the author originally published in the $ensible Sound magazine. Timothy Foley, The Great American Main Street Band. EMI 50999 6 41122 2. 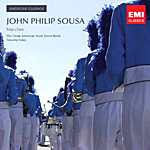 As I've mentioned before, John Philip Sousa (1854-1932) was to marches what the Strausses were to waltzes. He wrote a slew of them, everybody loved them, and all of them remain popular. The American composer and conductor led several bands, including the "The President's Own" Marine Band and the Sousa Band. During this time, he wrote some 136 marches, many of which people can still whistle or hum from memory, as well as a flock of dances and operettas, which bands all over the world continue to play. Sousa, we have not forgotten you. The present disc offers a generous collection of twenty-two of Sousa's marches and dances, some of the marches very well known, like "El Capitan," "King Cotton," "The Liberty Bell," "Manhattan Beach," "The Washington Post," and, of course, "The Stars and Stripes Forever!" But there are a number of lesser-known works as well, like "The Pathfinder of Panama," "Who's Who in Navy Blue," "Mikado March," and the thirty-second "Here's to Your Health, Sir!" Just as important are the dances, most of which are quite fetching. "The Gliding Girl" is especially appealing for its tango rhythms; "The Presidential Polonaise" written for President Chester A. Arthur, who asked for something less formal than "Hail to the Chief"; "Ancient and Honorable Artillery Company," with its strains of the company's marching song, "Auld Lang Syne"; and "With Pleasure," a ragtime that might have come from Scott Joplin. Col. Timothy Foley leads his players in zesty treatments of the music, among my favorites for some time. Which brings up a mystery: When EMI originally released this Angel recording in 1991, they called it A Grand Sousa Concert, and they identified the ensemble as "The Nonpareil Wind Band." Now, in this 2010 reissue, EMI calls the group "The Great American Main Street Band." Maybe it's a copyright issue or something; I don't know. Also, the older release prominently pointed out that the band's leaders were Mark Gould, principal trumpet of the Metropolitan Opera Orchestra, and Sam Pilafian, tuba player and founding member of the Empire Brass Quintet, and that the Nonpareil Wind Band featured "virtuoso brass and wind players." The current booklet notes say nothing about the band, its leaders, or its conductor, Timothy Foley, who until his retirement in 2004 was the Director of "The President's Own" Marine Band. Odd. Be that as it may, this is a terrific program of varied Sousa tunes and one that I've cherished for the past twenty years. It's good to see it back in the catalogue, even if the record company isn't giving full credit where credit is due. Recorded in 1990 at the Rye Presbyterian Church, Rye, New York, the sound is excellent, clear without being bright, aggressive, or edgy. In fact, it's one of the best-recorded collections of Sousa music I've heard. There are wide frequency and dynamic ranges involved, with gleaming brass and a good, solid thump on the bass drum. More than sufficient impact and a smooth midrange response make for a realistic listening experience, with only the last degree of stage depth missing in the equation. Still, it's more than good enough. Imogen Cooper, piano and director; Bradley Creswick, leader and co-director. Northern Sinfonia. Avie AV2200. There is obviously no want of Mozart piano concerto recordings. But given the composer's continued popularity, can there ever be too many? This new one of the Piano Concertos Nos. 18 and 20 from British pianist Imogen Cooper and the British chamber orchestra the Northern Sinfonia makes a welcome addition to the field. The program begins with the Piano Concerto No. 22, K482 (1785). Ms. Cooper, a virtuoso pianist, plays the opening movement (after a lengthy orchestral introduction) with vitality, to be sure, but with an exquisite eloquence, too. Never rushed, it nevertheless moves fleetingly along. The middle-movement Andante is probably the work's most salient feature, if not its most famous, and the composer himself noted to his father that when he played it, audiences would often request him to play encores of it. Ms. Cooper emphasizes its combination of poetry, lyricism, and emotional intensity (and with a touch of the "Repeat" button, one can easily accommodate encores). In the concluding Allegro Ms. Cooper takes its familiar little tune and makes it sound more relaxed and refined than playful or cute, with the orchestra participating almost as a soloist in itself. Incidentally, the booklet note explains that Mozart left no cadenzas for this piece, so Ms. Cooper uses those written for Paul Badura-Skoda. In any case, she plays with a strong, straightforward, unmannered style that makes the work sound fresher than usual. Mozart wrote the Piano Concerto No. 18, K456, in 1784, apparently for the blind pianist and singer Maria Theresia von Paradis. It's scored more lightly than No. 22 and, consequently, appears more delicate and frothy. 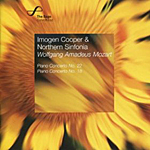 However, one should not take it too lightly, because as Ms. Cooper amply demonstrates, it contains some of the composer's more imaginative and felicitous writing. As always from this source, the sound is exemplary in most ways, with excellent clarity and dynamics, wide stage dimensions, moderate depth, and a pleasant ambient bloom. Avie recorded it a little close yet without any distracting glare or edge. The piano is a tad too big for my liking, yet its tone seems pure and natural. Recorded November 9-11, 2009, in Hall One of The Sage Gateshead, England, the performances come off cleanly and realistically. Like the interpretations, the audio sounds cultured, cushy, and comfortable. Johannes Goritski, German Chamber Academy Neuss. CPO 999 379-2. Here's an early companion disc to the CPO Michael Haydn set I reviewed more recently. Neither the music-loving public nor the recording industry has been particularly kind toward Joseph Haydn's brother, Michael. Where you'll find hundreds if not thousands of recordings of Joseph's works, you find only a relative handful of discs presently representing brother Michael's many hundreds of works. He was certainly almost as equally prolific as his brother but, unfortunately, nowhere near as original, profound, witty, clever, or, ultimately, vital. 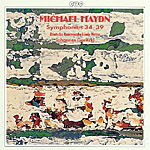 Of Michael Haydn's forty-one symphonies, record companies have recorded but a dozen or two in stereo, and, I believe, this disc gathers together most of the six pieces represented here for very first time. The Austrian composer Johann Michael Haydn (1737-1806) was, of course, Joseph's younger brother. People today probably know him best for his sacred choral pieces, and in this regard some scholars believe his work may have influenced Mozart. Moreover, he taught Carl Maria von Weber and Anton Diabelli, so, yes, he was quite important in his day. While not as memorable as the works of his more illustrious sibling, the later symphonies on this disc have strong characters of their own. Nos. 34 and 36 are particularly strong and inventive, and all of them come in typical three-movement, fast-slow-fast, Classical style. The interpretations from Maestro Johannes Goritski and the German Chamber Academy Neuss seem more perfunctory than infectious, but they suffice to deliver the disposition of the music. For the collector or for the fancier of this musical period, the collection is a necessity and makes a good addition to the other CPO recordings of Michael Haydn's works from Goritski. For the merely curious, though, I recommend the sound above the performances. The CPO audio engineers succeed in reproducing a big, bold sonic picture, reasonably well placed within an agreeable acoustic setting. While not purely audiophile in the sense of high definition, the sound is natural and pleasing to the ear. This music is hardly adventurous, but it is different, it is historical, and it is congenial; reasons enough, perhaps, for it to deserve a place on one's shelf alongside more noteworthy names. Also, The Perfect Fool, ballet music; Egdon Heath. Sir Adrian Boult, BBC Symphony Orchestra and Chorus; London Philharmonic Orchestra. HDTT HDCD215. Sir Adrian Boult (1889-1983) was the distinguished conductor who did so much to promote British music in the first half of the twentieth century and beyond. Fortunately, he lived long enough into the stereo era to leave us plenty of fine recordings that testify to his importance as well. Arnold Bax, Arthur Bliss, Edward Elgar, Gustav Holst, and Ralph Vaughan Williams are but a few of the composers whose works Boult championed. Holst (1874-1934) thought so highly of him, the composer asked him to premiere his most-famous piece, The Planets. So it's always good to have one of Boult's recordings restored to its finery, like this album of three Holst compositions. 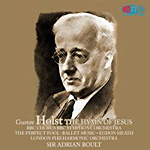 The program begins with The Hymn of Jesus, which Holst wrote around the same period he wrote The Planets, finishing it in 1917, both works the products of the First World War. The Hymn of Jesus is a little over seventeen minutes long, and in performing it Boult conducts the BBC Symphony Orchestra and Chorus, the orchestra a group he led for many years. One can immediately hear similarities between the Hymn and the Planets almost from the opening notes; the former starts very gently before the chorus enters, and then the flow of melodic ideas and the various harmonies remind one of The Planets suite. Although it never reaches the thrilling pitch or serene bliss of The Planets, Holst's Hymn, which the composer translated from the original Greek, is quite lovely in its gentle, spiritual manner. Holst wrote the opera The Perfect Fool a few years later, in 1921, and Boult gives us the ballet music from it, this time the conductor leading another ensemble he headed up for years, the London Philharmonic. The often-aggressive, self-assured ballet music makes a splendid contrast to the greater serenity of The Hymn of Jesus, the ballet music big and brash and a workout for one's speakers. It's about ten minutes long and rather a showpiece even for Holst, going from hugely forward, almost bombastic passages to moments of gentle tranquility. The program concludes with the thirteen-minute symphonic poem Egdon Heath from 1927, a dark, gloomy affair reflecting the nature of the landscape Holst was describing. There's a bleakness to the music, a starkness, that nonetheless never inhibits its vibrant tone. So we've got kind of depressing music that is never actually depressing. It's probably the best thing on the album in its descriptive beauty. HDTT (High Definition Tape Transfers) have made this album available in several different formats, the one I listened to being an HDCD. Although HDTT usually transfer their recordings from tape, in this case they used a Decca vinyl LP, recorded in Kingsway Hall, London, in 1961. The sound exhibits a very wide dynamic range, with HDTT using enough noise reduction to keep ticks, pops, and hiss to the barest minimum without affecting the tonal balance or high end. There is the occasional odd background noise, to be sure, but it's nothing distracting. Voices in The Hymn of Jesus are a little bright in louder passages, and because of the wide dynamics they can sneak up and startle you. The Hymn also displays moderate depth and fairly good clarity, yet with a smooth orchestral response. It's the two items with the LPO, however, that provide the most sonic splendor. The Perfect Fool ballet music and Egdon Heath appear even more dynamic than the Hymn, with greater transparency and a better sense of depth. They are more in the demonstration class than the Hymn, with a fine ambient bloom offering an added dimension of realism. 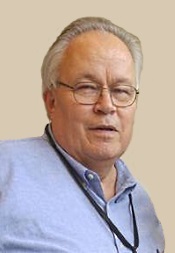 Eugene Mursky, piano. Profil PHO4066. Eugene Mursky, born in Uzbekistan in 1975, has won a number of international piano competitions and awards, and certainly he demonstrates the dexterity and flamboyance to one day become a world-class and world-famous pianist. His playing of the Chopin waltzes is dazzling in its technique and should win over more than a few new converts to his cause. 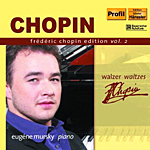 Polish composer and pianist Frederick Chopin (1810-1849) wrote about eighteen waltzes that scholars are sure of, with another dozen or so that some people question. The remarkable thing about them is not that they are in traditional ¾ waltz time but that Chopin intended them for concert play rather than dancing, and most of them are fairly difficult to play. Nevertheless, Mursky plays them with ease, with a sense of refinement and comfort, the interpretations almost completely free of pretense or affectation. In other words, he would appear to put the music ahead of himself. However, I would warn that comparisons can be hard on a fellow. My comparison in this case was Arthur Rubinstein, whose Chopin waltz recordings on RCA have always been my personal favorites. Side by side, I'm afraid Mursky, as good as he is, comes off as technically skilled rather than emotionally inspired. Rubinstein is both eloquent and articulate. His Chopin possesses brilliance and heart in equal measure. In contrast, Mursky can sometimes seem rushed, more content to display his blazing finger work than to put his soul into the music. Profil's recording is slightly closer than RCA's, too, providing a bit more precision but not as much bloom. Mursky seems to be performing in a studio, while Rubinstein could be on a concert stage. Both are quite good, just different. I might also add that at this time RCA offers the Rubinstein collection at mid price, whilst Profil is at full price. Also, Piazzolla: The Four Seasons of Buenos Aires. Lara St. John, violin; Eduardo Marturet, the Simon Bolivar Youth Orchestra of Venezuela. Ancalagon ANC 134. Although Antonio Vivaldi (1678-1741) wrote hundreds of pieces of music, people will probably always remember him best for his Four Seasons violin concertos, his little tone pictures with their chirping birds, galumphing horses, barking hounds, and dripping icicles. The music lover has about 800 different choices of recordings to choose among at any given time; however, that number keeps changing almost weekly as new discs arrive on the scene. This set by Lara St. John and the Simon Bolivar Youth Orchestra of Venezuela, lead by Eduardo Marturet, is one of dozens that appeared in just the last couple of years. While I loved Ms. St. John's rendering of Mozart's Sinfonia Concertante and Violin Concertos Nos. 1 and 3, also on an Ancalagon SACD, these Four Seasons are more problematical. Her pacing here is mostly moderate, designed neither to offend nor distract, at least at first. Nevertheless, her actual playing, which she does on a 1779 "Salabue" Guadagnini, sounds sometimes a bit more florid than necessary. I wondered if on occasion she wasn't just a little too plush and personal, too idiosyncratic to the point of excess, and that did distract my attention. If one is listening to the playing technique more than to the music, there's probably something wrong. Fortunately, hers is the kind of interpretative approach one can easily get used to. In other words, you'll either love these readings or hate them. I rather liked them, but I wouldn't say I liked them better than a dozen or so favorite performances of mine. The "Winter" concerto is possibly the best example of Ms. St. John's style because it appears to me the most touched by her particular individuality. It is odd in its wildly contrasting tempos, mood swings, and slowings down, often within the same movement. Never does she get really animated, yet she plays with considerable passion. As I say, odd. 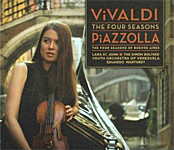 Accompanying the Vivaldi Four Seasons are the Four Seasons of Buenos Aires by Astor Piazzolla (1921-1992), the Argentinean composer and bandoneonist best known for his tango creations. He wrote his four Seasons not as a set but as completely separate entities for his own band. Only in 1999 did Russian composer Leonid Desyatnikov arrange them for solo violin and strings and make the Vivaldi connection. While they are fascinating works, they don't have much to do with Vivaldi beyond their title. These Piazzolla pieces, each written in a single brief movement, have a distinctive Latin-dance flavor to them, evoking tones quite different from Vivaldi's. The pairing seems to me more of a marketing ploy than a completely satisfying musical decision. Recorded in Caracas, Venezuela, in 2008, the sound on this hybrid disc comes in multichannel SACD and regular two-channel stereo. I listened in stereo, where the sonics are big and warm and a tad heavy for my taste in this music. Judging by the booklet picture, there appear to be a couple of dozen performers involved, although it's a little hard to tell from the recording, which puts Ms. St. John slightly out in front of what seems like a multitude of players in the ensemble around and behind her. Stage depth is modest, and a lot of ambient bloom in the midrange tends to diminish ultimate transparency. My guess is that the multichannel layer may be cleaner and clearer, and the regular stereo layer folds some of the rear-channel material into the front channels, clouding the issue somewhat. Finally, a couple of words about the packaging: namely, it's handsome and inconvenient. The disc comes housed in a cardboard foldout container that is attractive to look at. Beyond that, it's a nuisance to deal with. First, it folds out in three parts extending to some eighteen inches, thus making it cumbersome to handle. Next, there are two informational booklets enclosed--one in English and one in Spanish, French, and German--glued to the cardboard, thereby making them a chore to read. In addition, the disc come wedged into a stiff, permanent inner sleeve, defying anyone to get it out without putting fingerprints on the playing surface. Then there's the matter of the package opening left to right instead of the traditional right to left. Think of a book built backwards. Also, Nocturne in B major; Scherzo capriccioso. Marin Alsop, Baltimore Symphony Orchestra. Naxos 8.570995. Maestro Marin Alsop and her Baltimore Symphony Orchestra continue their cycle of Dvorak's nine symphonies, apparently working their way backward, as they had already released Symphonies Nos. 7, 8, and 9 before now issuing No. 6. So far, Ms. Alsop has given us fine recordings of the Eighth and Ninth, although I didn't care as much for her reading the Seventh. Czech composer Antonin Dvorak (1841-1904) premiered his Symphony No. 6 in D major, Op. 60, in 1881, after some resistance in Vienna, where he had intended for it to make its initial appearance. It's a delightful composition and one of the man's most-charming works. The opening movement is sunny and bright, with a pleasantly memorable central theme. Ms. Alsop plays it lightly but not frivolously, maintaining a good balance between seriousness and sentimentality. She and her orchestra impart a golden glow to the proceedings that is really quite fetching. The slow-movement Adagio moves firmly yet gracefully along as the Baltimore ensemble caress its plush tones. The Scherzo that follows pays tribute to an old Czech folk dance, which Alsop whips up to a furious pace, maintaining it until a more-rustic section intervenes. Then the Finale introduces a big Brahms-like melody, which concludes the work in high good spirits, Ms. Alsop taking every advantage of the jubilant atmosphere. This may be her best Dvorak performance to date. Of the two accompanying pieces, the composer published the Nocturne in B major, Op. 40, in 1883, adapting it from the slow movement of his earlier String Quartet in E minor. It's a lovely if slightly melancholy tune. The program ends with the Scherzo capriccioso, Op. 66, also from 1883. It is among Dvorak's best-known compositions, with a wonderfully lilting waltz at its heart, so Ms. Alsop closes the album in style. 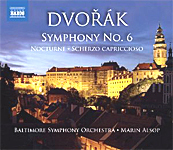 The sound, recorded live at Joseph Meyerhoff Symphony Hall, Baltimore, Ohio, in March 2008 and 2009 (the Scherzo capriccioso), is marginally less thick than it was in Alsop's Seventh and Eighth Symphony recordings, but it still doesn't reveal as much midrange detail as it might. It's somewhat soft, and there appears to be a smidgeon of lower-midrange/upper bass hangover that tends to cloud ultimate transparency a mite. Also, during quieter passages one can sometimes hear a soft rustling from the audience and/or the players. Fortunately, however, there is no applause to spoil the mood. While dynamics and frequency response in the Symphony and Nocturne are adequate, they are not in the demonstration class. In the Scherzo capriccioso, though, we hear a slightly greater punch. As with Naxos's previous Alsop Dvorak recordings, they provide the CD case with a handsome cardboard slipcover. Sabine Meyer and Julian Bliss, clarinets; Kenneth Sillito, Academy of St. Martin in the Fields. EMI Classics 0946 3 79786 2 7. Things begin in the lightest possible mood with Franz Krommer's Concerto for Two Clarinets (1815). Krommer (1759-1831) was the Czech (or, more precisely, Moravian) composer who did the bulk of his writing in Hungary and Austria, which at the time were among the music capitals of the world. Most of his hundred-odd works were symphonies, concertos, partitas (instrumental suites of variations), chamber music, and marches. The opening movement of the Concerto is as frothy and cheerful as it could be, the two young clarinetists, Sabine Meyer and Julian Bliss, seeming to have a good time in the give-and-take communication of their instruments. The second movement Adagio, however, seems to belong to a different work altogether, Don Giovanni perhaps, heavy and ponderous. Still, things lighten up again in the Finale, and in every case Kenneth Sillito and the Academy of St. Martin in the Fields provide elegant support, if lacking a little of the gusto they used to produce under Marriner. Then we move on to the most serious piece on the disc, Louis Spohr's Clarinet Concerto No. 4, with Ms. Meyer as soloist. Spohr (1784-1859) was the German violinist, conductor, and composer who briefly lit up the European musical skies as a figure almost as well known as Beethoven. Although today we remember him mainly for his oratorios and the work he did to develop the music drama, in his day critics considered his orchestral pieces as fine as Mozart's. How things change with the years. Slightly gloomy, sonorous, yet elevated, not only is the mood of the Clarinet Concerto No. 4 serious, but the orchestration is the most weighty of the three pieces in the collection, too, especially compared to the Krommer concerto. The program concludes with the music that strikes me as having the best balance between earnestness and lightheartedness, Spohr's Clarinet Concerto No. 2, lively and melodic. EMI's sound is lovely as well, not in the top echelon of recordings in terms of detail or transparency, perhaps, but radiating a sweet, natural, ambient bloom. The orchestra appears well spread out across the sound stage, the soloists are nicely centered when necessary, and the imaging conveys a realistic sense of depth and presence. It's all a most-pleasant experience. Alex Klein, oboe; Anthony Newman, New Brandenburg Collegium. Cedille FOUNDation CDR 7003. As you know, Cedille is a small, Chicago-based record company that specializes in using local talent to produce audiophile-quality discs. However, they also sometimes distribute material they didn't record themselves, issuing it on their mid-priced Cedille FOUNDation label, such as this album of Vivaldi oboe concertos originally released by the Musical Heritage Society in 1995. Italian priest, violinist, and composer Antonio Vivaldi (1678-1741) produced a ton of scores, composed largely while he was a music teacher at the Ospedale dlla Pieta, a home for poor, orphaned, or abandoned girls. His compositions include not only the familiar Four Seasons but over forty-five operas, ninety sonatas, multitudinous choral pieces, and some five-hundred concertos. If many of us tend to think of his work as sounding pretty much alike, especially the concertos, I'd say we have every reason for thinking so. For instance, I had no idea the man wrote as many oboe concertos as he did, over twenty of them, several in dispute. This disc contains eight concertos for oboe and strings, the program totaling about seventy-five minutes. The soloist here is Alex Klein, a multiple award winner and former principal oboist for the Chicago Symphony Orchestra, probably the connection to Cedille. He and the New Brandenburg Collegium, a group with which I am unfamiliar, provide lively, entertaining interpretations of the music, Klein's playing wonderfully versatile and virtuosic. He and the ensemble perform these works with great spontaneity and verve. Indeed, I have no idea when the man stops to take a breath, but his style is beautifully fluid, extended, and endlessly dazzling. 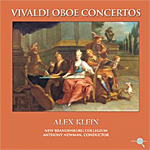 Klein's booklet notes comment on these concertos in all likelihood being too difficult for oboists of Vivaldi's day to play, and one listen to the musical gymnastics Klein performs on his oboe confirms the opinion. The music requires the utmost expertise, which Klein just happens to possess. As for the concertos themselves, well, even though I've heard them a number of times over the years, I admit I could never tell them apart, then or now. If it's of any interest, of the concertos on this disc I prefer the one in C Major, F. VII, No. 6, best of all for its delightful yet mature spirit. Recorded in September, 1993, at the Performing Arts Center of the State University of New York, the sound is fairly close but with a warm, smooth response. There's a wide stereo spread, with a good dynamic thrust and a reasonably clear midrange. While the high and low ends might have shown greater range and the stage depth could have been more pronounced, these concerns are almost inconsequential when listening to such sparkling performances. The playing and the music make you forget almost everything else. 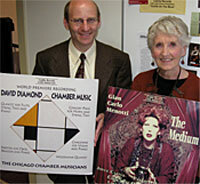 In 2010, the Opus Arte Web site relaunched as an on-line classical music store. Opus Arte is a classical music production and distribution company, owned by the Royal Opera House. It releases approximately thirty opera, ballet, and classical music titles on DVD and Blu-ray per year, along with a selection of CDs. In 2010, the Opus Arte Web site (http://www.opusarte.com/en/) was relaunched as an on-line classical music store, selling music across all formats (CD, DVD, Blu-ray, MP3, digital video download) from the world's leading classical music labels. Opus Arte is pioneering new methods for classical music consumption, championing track and video downloads, as well as offering bundles of digital and hardware content. Opus Arte was first established in 1999 by Managing Director Hans Petri and Television Director Dirk Jan Bijke. The company has produced and directed programmes that have been broadcast in over sixty countries and won numerous awards.